This was the very first CD we produced, done at the urging of those who told us that as good as the plans are they really would like to see pictures of the process. There are a ton of them on this CD, detailing the process from making her moulds all the way through rigging. As stated elsewhere, this is intended to be viewed on your computer; you cannot print from this CD. Since it is in Adobe Acrobat format, however, you can avail yourself of that program's search feature to find exactly what you are looking for with a couple of clicks. As you can see, this is a lot more than just photos. The page on the left, for example, describes fastening the garboard to the plank keel. But because this is illustrated with shop photos instead of words alone, you have the opportunity to see things that might not be included otherwise: the marking gauge used, the type and placement of clamps, the mirror used to inspect the fit inboard, and the fastening layout. The planking section alone runs 22 pages and has 47 photos. 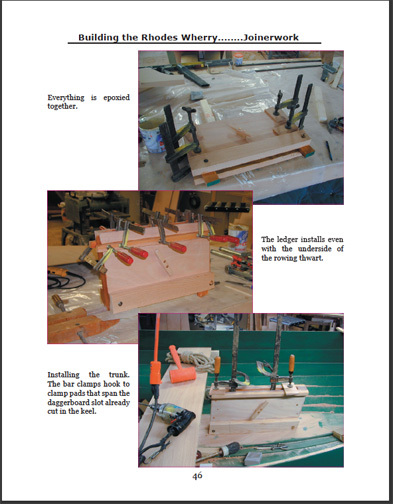 The right-hand page describes assembly and installation of the daggerboard case, and again, the tools used are all right there in the photo along with three different views of the trunk. Did you realize that the easiest way to get the top trim right was to leave the sides taller than needed, so that it could be put in the boat temporarily and then marked from the thwart? That shows clearly on this page. 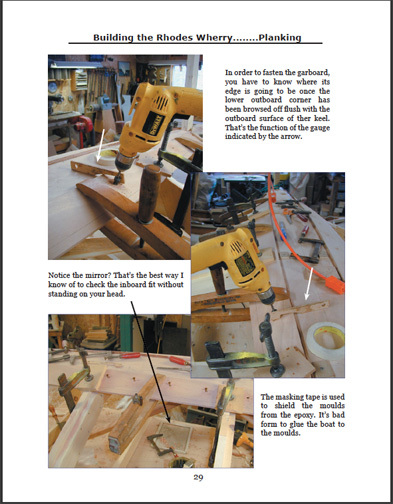 There are actually a couple of additional pages just on making the trunk and the daggerboard.The joinerwork section consists of 15 pages with 31 photos.